We love to take weekend getaways and we try to visit Gettysburg a few times every year. Like most tourist-towns, you'll find gobs and gobs of places to eat. Gettysburg is no exception! You'll find fine dining, casual dining, fast food, pizza parlors, cafes, ice cream shops, candy stores, coffee shops and more! 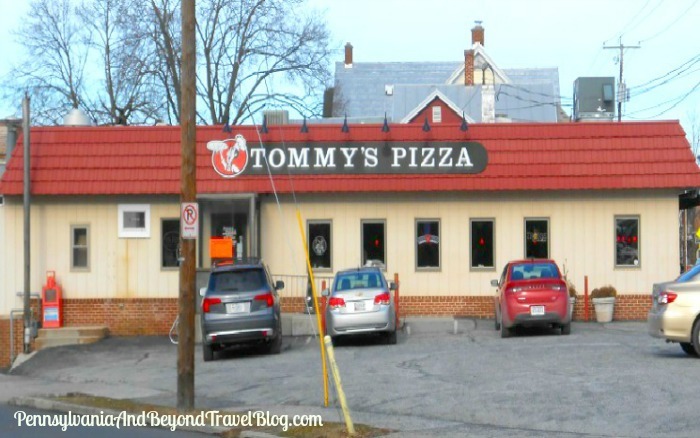 Like most people in this world, we love pizza and every time we visit Gettysburg we make sure that we stop into Tommy's Pizza located at 105 Steinwehr Avenue who has the best pizza in town. At least, in our personal opinion, Tommy's has the best pizza! Tommy's pizza serves up all kinds of different homemade pizzas. One of our favorites to get is the Veggie Pizza. In addition to the pizza, they offer chicken wings (we love their BBQ wings), homemade subs, french fries, onion rings, mozzarella sticks, chicken fingers, stromboli, gyro's, various salads and more. In regards to pricing, we feel that almost all of their offerings are competitively priced. With that said, you will pay MORE for a pizza from Tommy's than what you will pay from a franchise store. However, we feel that it's worth the extra price because it's really good....REALLY, REALLY... GOOD! They offer FREE parking in their parking lot for patrons or you can hit up one of the parking meters out front, should their parking lot be full. You can dine-in or order take-out. We have dined in and have ordered takeout with great results! Our food is always made-to-order and our hot items are piping hot and our cold items are cold. If you're planning a visit to Gettysburg and looking for the best pizza in town, we highly recommend that you check out Tommy's Pizza. It's our favorite! It's the perfect place to stop for a casual lunch or dinner after touring the historic Gettysburg Battlefield or other area attractions. Note: All photos in this feature are clickable. You can click on each photo to have it open up in a new browsing window and in an enlarged size. We're a mobile reader-friendly travel blog. Thanks!